Beth Macy is a reporter for a newspaper in Roanoke and is working on a third book. Tips on recognizing the differences between writing a biography or non-fiction narrative and even long-form newswriting and marketing what you have written from sessions at Bio 2016 conference in Richmond. 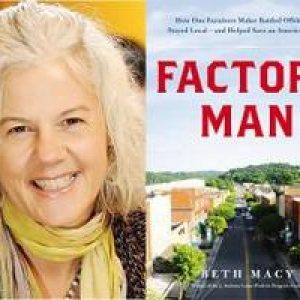 Beth Macy: The author of Factory Man said her subject, a member of the Bassett family, a one-time furniture giant, comes from an area of Virginia best known for Bluegrass music and barbecue, but went on a one-man crusade to find evidence that China was dumping furniture into the American market to drive U.S. companies out of business. “The family was land rich and cash poor” for generations before the dumping case. Macy said she asked herself, “What would Robert Caro do” when she came to writing about a scene involving a fistfight in the family that no one wanted to talk about. Her answer,”find the ambulance driver” who took away one of the combatants and was paid $100 to remain silent for decades. Macy said there are two approaches to this: approaching it as what will happen next or mystery. J. Stiles: The author of the First Tycoon: The Epic Life of Cornelius Vanderbilt “started off with the moment of his death and the impact” it had on the family, American business, and the nation generally. He said in the writing he drew upon the “outer narrative” and “inner narrative” and how they related to each other. “What really am I trying to do?” Make the reader “turn the page” and “wonder what’s going to happen next” and bring it to “provisional resolution” on every page. “Conflict in an of itself is not a narrative arce” but it can provide a means to finding the “saving grace” in a character to bring that person to life. Macy: “Digress often, but not too long. Applegate: “I’m a big fan of tell less” with a strong point of view and “keeping it narrow on actions.” This is “giving [readers] just enough … to know. Macy: In her newest book, all the documents on the kidnapped orphans who are the subjects of the work were written from a racist point of view. “Have a clear message. Who’s your audience and you have to communicate that message to them through many channels. Where 20 years ago reaching an audience could be cumbersome — faxing, the “internet made this much easier.” It’s free and his company moved from weekly information send-outs by fax to three times a week to now using social media. “You can reach a critical mass” through the internet and social media. Work on finding an appealing title [packaging including blurbs], and realize the need for an editor. By seeking blurbs from even potential reviewers, it buys an author a “round of protection.” Get reviewed in Kirkus, Publishers Weekly and Booklist. First constituency to approach — journalists, bloggers, websites, radio shows, podcasts, associations with conferences looking for speakers. In short, “content-starved constituency.” Build up media clips for your website. “Look for multipliers” to create an upward spiral of recognition of you and your work.